This past weekend was so busy I barely had time to take my camera out to capture any of it. Friday night we celebrated LK's starting classes at a local college so that she can start a new career. Its so full of possibility and I'm so excited for her. 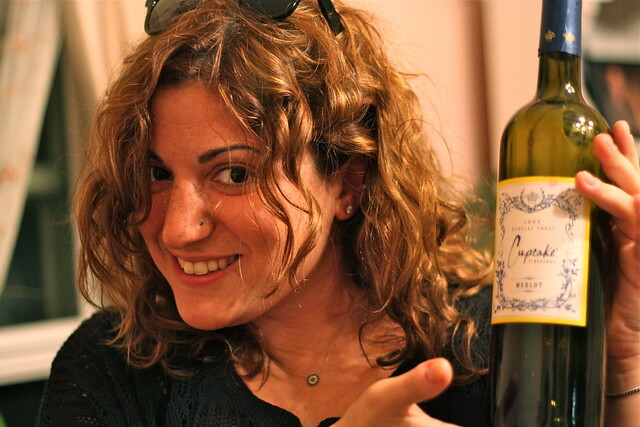 The occasion called for a bottle of Merlot from Cupcake Vineyards (its one of my favorites). My camera stayed at home because we were going to a new bar that recently opened and we weren't sure what to expect. 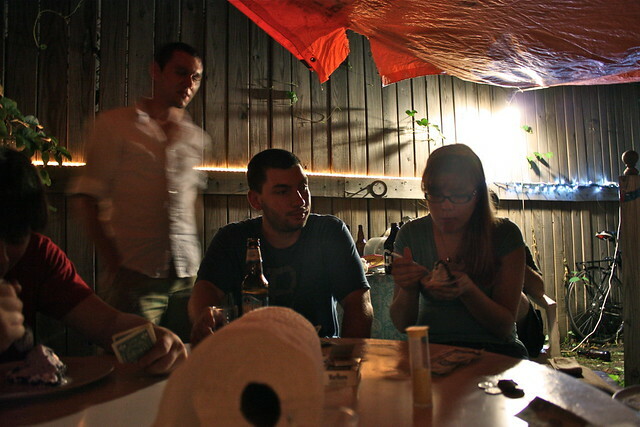 Its called Rooftop 32, and the crowd would have been better suited to our parents. They almost didn't let me in because I'm not 25 yet. Luckily, its only a block away from one of our favorite pubs where we met up with Rich and some other friends for the rest of the evening. Early Saturday morning I went to cheer my mom on at a race. She's a competitive distance runner when she isn't teaching elementary school art. The race was so exciting, and I was just so proud of her that I almost forgot to snap pictures. Saturday night Rich's friend from college had a birthday party in the Bronx. I've never really spent time in that borough, and I also hadn't met many of the people that would be there. His friends, who are married, have the sweetest apartment. Its very spacious and the walls are covered in his artwork. There is even a tiny courtyard in the front and a backyard! Mostly we sat in the back under a tarp listening to the rain and music. The party's theme was a beer tasting and everyone brought something to try. We brought our local favorite, Barrier Brewing's Ruthless Rye IPA (which is currently being renamed!). Could the Bronx be the new Brooklyn? 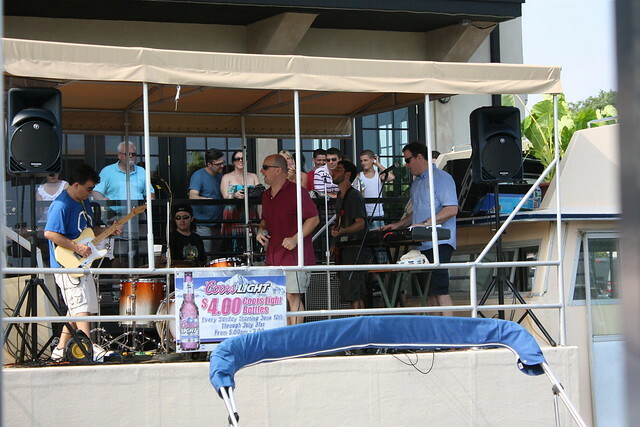 On Sunday we drove home from the Bronx and saw on Facebook that our friend's cover band was playing all afternoon at a bar on the water. It was a bit spur of the moment, but we biked over to check it out. This is one of the cooler venues they play at sometimes because the stage is actually on a boat that is docked up alongside the bar. At one point some swans came over to see what all the noise was. Maybe the weirdest thing going on was that there was a swimsuit model doing all kinds of weird poses on a boat across the water. I wasn't sure what she was doing until I realized she was having her picture taken, for a minute I was like, "Is she serious? how uncomfortable is is to be leaning like that for so long?" 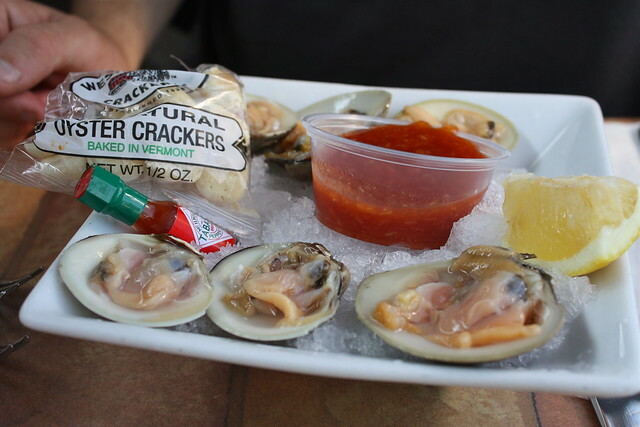 Rich even ordered some fresh clams which I won't eat because they look gross, but there was teenytiny tabasco sauce! 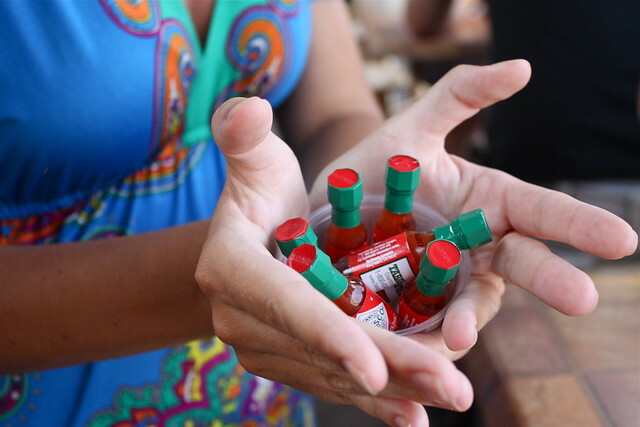 Our friend Colleen loves tiny things and asked if she could have a tiny-tabasco too, so they gave her a whole handful. One of my friends was there that I hadn't seen in awhile (OK, it was my ex boyfriend who used to appear on the blog from time to time) but I didn't find it weird. I hope he didn't think it was awkward, because though we probably won't see one another very soon it was still nice to catch up. Anyway, that was the weekend! Did you do anything fun? Link me to your blog of you wrote about it! Lovely photos...I love prying into ppl's weekend lives :) I particularly like your footwear in the second pic...it's nice to see a style blogger kicking back! Wow, that is a busy weekend! Sounds like a lot of fun =) Also...Cupcake Merlot is so good! I've had it a couple times at this wine bar in Pasadena called Magnolia. Looks like you had an adorable weekend. Those tiny tabasco bottles was just adorable, I want them! Myself, I was going buy the flee markets in town and found some great finds. Cupcake Merlot I love the name, I would purchase it just for the name. sounds and looks like you had a great weekend, mine was a little more stationary and less active :) the little tobasco sauces look so cute and loving your outfit in the second picture, I like how you tied your blouse. I can't believe you're under 25 -- you seem so mature I assumed you were older. Then again, you have the beauty of youth on your side. 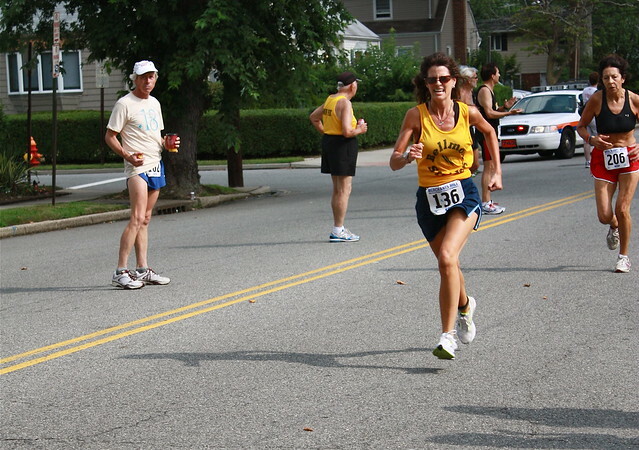 Kudos to your mom on her running. It's really important to stay in shape when we get older. Clams are delicious. They look icky, so you have to close your eyes, put the shell up to your lips, and slurp them down without peeking. They have a delightful salt-water flavor that reminds me of the beach. I had a great weekend which included a blogger meetup with someone from another country. Post on its way! Wow, it sounds like you had an awesome weekend! I read your tweet about sometimes needing a weekend to recover from your weekend, and I can totally relate! That so cool that your mom is a runner. Seriously, I couldn't do that, and I'm always inspired when people my parent's age are in better shape than me! It's also cool that she's an elementary art teacher...what an awesome job! Also, I love that top! The tiny Tabasco is cute! Cupcake wine is one of my favorites - I love their Chard and the Red blend. Your life is so adorable! Oh man-took my very English boyfriend to his very first, very American state fair:) Ate fried cheese and got rained on. It was pretty great!Sounds like yours was too! 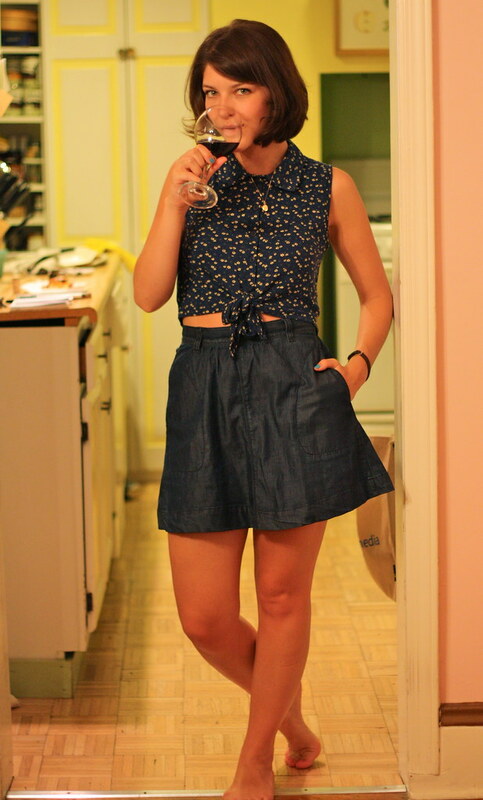 Really love what you're wearing in this post, wish I could pull of that outfit!